Talking Rain Beverage Company has been dedicated to producing refreshing beverages for over twenty five years. They pride themselves on creating beverage products of exceptional quality and value for you and your family.Their popular drink, Sparkling ICE, combines mountain spring water, fruit juice, vitamins, and antioxidants to create a tasty, lightly carbonated, liquid refreshment in assorted juicy flavors. I was already a big fan of Sparkling ICE, in fact I first tried them sometime last Summer when I decided to buy a case from my local Costco. It was on for an awesome deal and well worth it for a case of 24 bottles. I was very pleased with the outcome, but in my case there were only four flavors, Strawberry Kiwi, Black Raspberry, Orange Mango and Lemon Lime. Out of those four hands down the Black Raspberry was my favorite. The taste of all those berries was perfect and was a great beverage to have in the Summer. When I got the opportunity to review all eight of their flavors I was excited to try the other four flavors, Pink Grapefruit, Coconut Pineapple, Lemonade and Pomegranate Berry. Tasting the other four flavored drinks were great and made me wish all four of these flavors were available in a case of their own. They were that good. And hands down I would have said my favorite was Pink Grapefruit until I tried their Coconut Pineapple. It was just delicious and smooth and left me wanting more. My husband, is still a huge fan of their Orange Mango, but he loves orange everything. 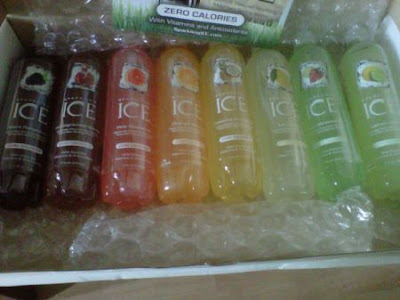 Not only is Sparkling ICE refreshing and tasteful, they're also ZERO calories, ZERO carbs and NO sodium in these drinks. I was very impressed. They also have NO sugar in them, so this is definitely a guilt free beverage you can enjoy for all occasions, especially those of us that are still trying to loose those pounds. These drinks will definitely be perfect for this Summer to share with friends and family or maybe I'll keep them to myself, lol. Disclosure: All opinions are my own. I received all eight flavors of Sparkling ICE at no cost for the purpose of this review. No other compensation was received. A big thank you to Talking Rain for providing the giveaway prize!